Scripps Ranch is an upscale, family-oriented community centrally located about 16 miles from both Downtown San Diego and the Coast. This unique community is known for its small town feel, lush groves of Eucalyptus, Cedar, and Pine trees, and stunning mountain views, which are almost as favorable in San Diego real estate as an ocean view. Scripps Ranch is also home to beautiful Lake Miramar which offers fishing, picnicking, and boating facilities year around and is surrounded by a five mile running, skating, and biking path, providing an opportunity for outdoor exercise in a peaceful atmosphere. The annual Scripps Ranch "4th of July Run and Ride" is held at Lake Miramar where both runners and walkers can choose from a 10K Race or a Two Mile Fun Run. 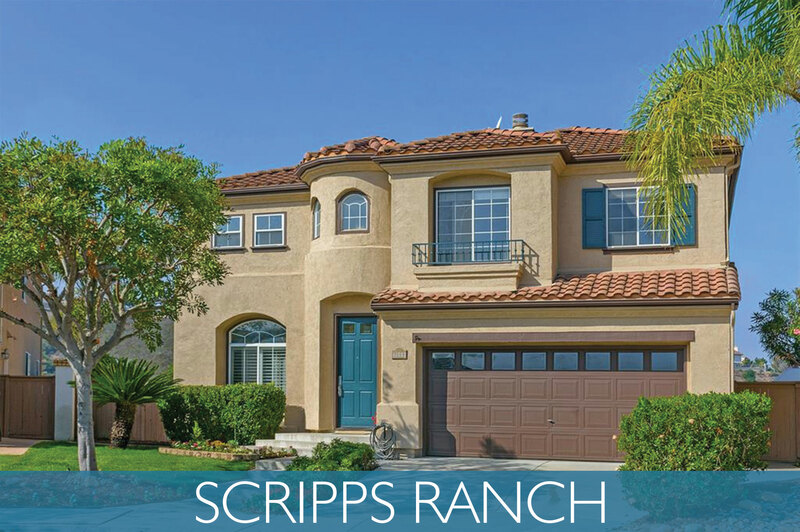 View more about Scripps Ranch on Pinterest! Neighborhoods in Scripps Ranch are spacious, well-maintained, and perched along mesas, allowing for an abundance of beautiful countryside views. Tucked away deep within Scripps Ranch's most coveted rolling hills is the elegant planned luxury community known as "The Estates at Stonebridge". Often referred to by San Diego locals as "Rancho Santa Fe East", "The Estates at Stonebridge" is a thoughtfully planned paradise. Almost 80% of the community's natural, open spaces are comprised of California native trees and fauna. There are nearly 16 miles of hiking trails as well as a sports park and a planned community park. There are eight subdivisions in "The Estates", all of which include spacious family homes and estate properties. Families often move to Scripps Ranch and "The Estates at Stonebridge" because of the high quality schools, community atmosphere, and activities. Recently built facilities include the Scripps Ranch Village Center, a community recreation center, a state-of-the-art library and a fire station, all of which add to the value and charm of this special community. A variety of recreational activities are also offered including soccer, baseball, and basketball. Those looking to "tee off" can hone their skills on one of the many nearby golf courses. Many residents enjoy membership in local clubs and organizations and the library serves as a community center for adults, kids, and families. Scripps Ranch school rankings are between the 80th and 90th percentiles and all public schools lead to Scripps Ranch High School, unifying the community. Education is further enforced with nearby Miramar College offering courses to the community at large. Many families find raising children favorable in this town, with over 25% of its population under age 18.